Enjoy an unforgettable day out in London with this unique experience featuring The View from The Shard and a three-course meal for two at one of London Steakhouse Co's restaurants in City or Chelsea. On entry to The Shard you'll ascend 800ft in a matter of seconds to reach the top of Western Europe’s tallest building. You’ll step onto an open viewing platform to enjoy one of the most incredible experiences in the country as you gaze out across 40 miles of the capital. As part of this sensational experience, you’ll also be welcomed into one of the award-winning London Steakhouse Co restaurants for a delicious three-course meal with a cocktail each. Sit back and relax as you peruse the mouth-watering set menu, available for lunch or dinner, featuring a selection of tasty appetisers, high-quality steaks, roast meats, fish, and timeless puddings. It’s up to you whether you visit The Shard before or after your meal and either way, you’re sure to enjoy a day out to remember with this magnificent experience for two. When you call our reservation team, we will book your visit to the Shard and your meal at the London Steakhouse Co at the same time. For your visit to the Shard, you must please bring a form of identification that matches the Lead Traveller name on your Shard ticket, with you on the day of your visit, as this may be checked before Shard entry is allowed. To begin your Shard visit, you will show your pre-purchased ticket and jump the queue to the next viewing time. The View from the Shard has a strict no refund policy on cancellations. If you decide you want to change the time of your booking you must call us no later than 72 hours before your visit with your booking reference number to hand. Both of our restaurants are easy to get to from The Shard. London Steakhouse Co - Chelsea is a 30minute taxi ride or a 32 minute tube ride from the Shard (on the Jubilee then Piccadilly line). 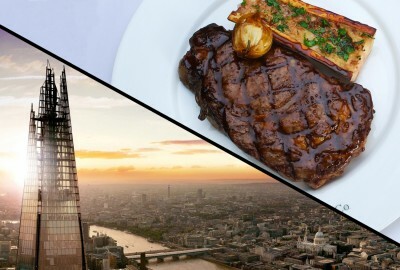 London Steakhouse Co - City is just 15 minutes away from the Shard in a taxi and 17 minutes on the bus (no.149, 47 or 344). This dining experience is valid every day of the year except dinner on New Year's Eve, and Valentine's Day.